Megan Rossi-Bremer elected to DGS Hall of Fame! Megan Rossi-Bremer (DGS class of 2003) has been elected to the DGS Athletic Hall of Fame. Megan was a two time All-State performer in track & field as a member of the 4x800m relay and the pole vault. Megan was an individual state qualifier in the 800m run and the anchor leg on the all-state 4x800m relay team in 2002. She also held the indoor school record in the 800m until it was recently broken 2 years ago. Megan was even more accomplished as a pole vaulter. She was one of the pioneers in the girls’ pole vault event in Illinois. 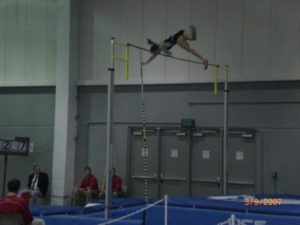 Girls began competing in the pole vault in Illinois when Megan was a sophomore in 2001. 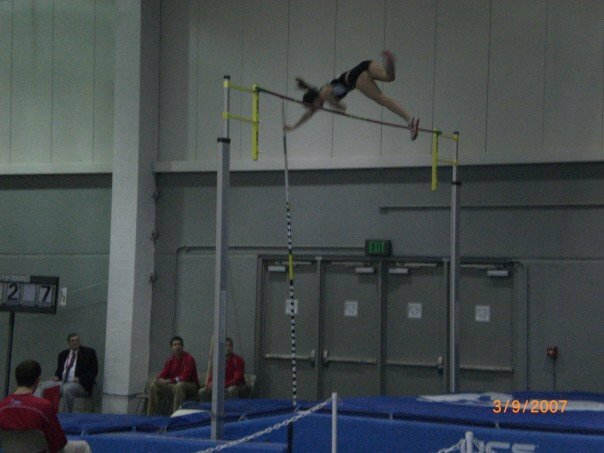 She took up the challenge and became one of the best female vaulters in Illinois in 2002 and 2003, culminating with her 4th place finish in the 2003 state meet. Megan still holds the DGS school record in the pole vault (11’3”). 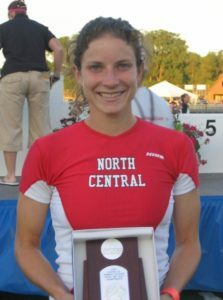 Megan went on to compete at North Central College in Naperville where she won NCAA DIII national championships in the pole vault twice (2005 & 2007). In 2007, her vault of 12’11.5” set the DIII national record. Megan also ran on the varsity cross country team and was the homecoming queen her senior year. Megan is currently a teacher at Winnebago Middle School in northwest Illinois and coaches the pole vaulters at Winnebago High School. She is married to Jacob Bremer and is also the mother of three. Hall of Fame induction will take place on January 28, 2017 prior to the tip off of the boys varsity basketball game at approximately 5:45pm. Author Coach PlunkettPosted on November 17, 2016 January 27, 2017 Categories Cross Country, Track & FieldLeave a comment on Megan Rossi-Bremer elected to DGS Hall of Fame! 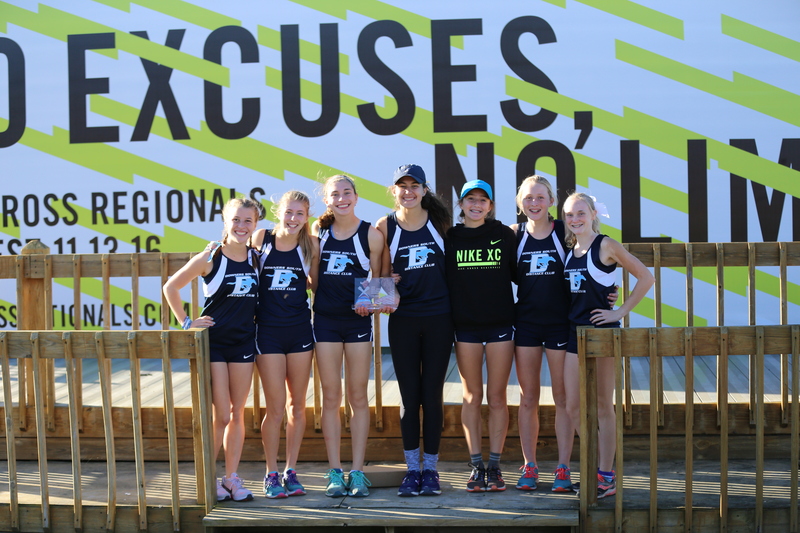 Several members of the DGS girls cross country team traveled to Terre Haute, Indiana last weekend for the Nike sponsored NXR Midwest Regional meet. Even though the official DGS season concluded with the Nov. 5th IHSA State meet, these girls chose to organize as the ‘Downers South Distance Club‘ and compete in one final race. The meet was held at the Lavern Gibson Championship Cross Country 5K course which is also the site of this year’s NCAA D1 national championship race. High school competitors from Illinois, Indiana, Missouri, Michigan, and Ohio gathered to try and earn a spot in the NXN meet to be held in Portland next month. Most of the top teams from Illinois and the surrounding states entered the competition on Sunday. While the teams are not officially affiliated with their respective high schools, most teams organize themselves as a club with parent sponsors in order to compete. The top 2 teams and the top 5 individuals qualified for the Dec. 3rd NXN meet. The field included state championship teams from 5 different states. The DGS girls performed exceptionally well and finished 7th overall as the teams from Illinois seemed to be stronger as a group. Although Indiana state champions, Carmel HS finished 1st, teams from Illinois finished 2nd, 3rd, 4th, 6th, 7th, and 8th out of 31 teams entered in the championship division. In addition to Carmel HS, Naperville North (Illinois 3A champions) earned the 2nd qualifying position for NXN. Both Minooka (3rd) and Yorkville (4th) could earn at-large invitations to the Portland meet. Brenna Cohoon (Fr) led the DSDC team with her 59th place finish in the slightly longer 5K race. DGS state meet competitors Katie Stapleton (Sr), Melissa Weidner (So), Erin Reidy (Fr), Becky Versaskas (So), Olivia Duax (So), and Kennedy Warden (Fr) also competed in the championship division race. Allison Calek (So) led the DSDC team that competed in the Open Invitational race. Individual results/splits can be found on the Schedule/Results page. Full meet results and team scores can be found on the Athletic.net website. Pictures from the meet can be found on the Pictures/Video page. Thanks to parents Mike Weidner, Laura Duffy, and Karin Warden for organizing the trip for the girls. And thanks to all of the parents that provided uniforms, transportation, etc. and helped make the trip possible. Author Coach PlunkettPosted on November 15, 2016 Categories Cross CountryLeave a comment on NXR Midwest Results! DGS Girls CC 4th in State! 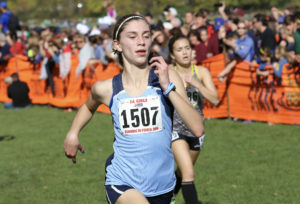 The Downers Grove South girls cross country team placed 4th at Saturday’s IHSA State Championship meet in Peoria. Naperville North took 1st place with 111 pts, Yorkville was 2nd with 130 pts, Minooka was 3rd with 134 pts, while DGS scored 245 pts for 4th place. Brenna Cohoon (Fr) led the Mustangs for the 3rd week in a row, placing 38th with a time of 17:36. Katie Stapleton (Sr) led a pack of DGS runners with her 58th place finish in 17:53. She was followed closely by Melissa Weidner (So) in 63rd place in 17:57, Becky Versaskas (So) in 67th place in 18:01, and Erin Reidy (Fr) in 73rd place in 18:04. 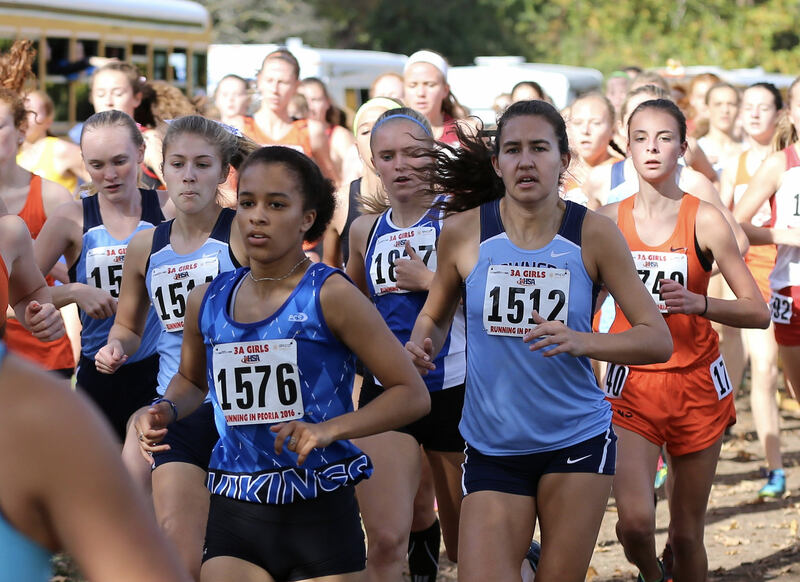 Kennedy Warden (Fr) was not too far behind in 107th place in 18:27 with Olivia Duax (So) placing 162nd in 18:56. DGS was able to outperform their ranking by the power of their pack. The team got out well together and had 6 runners within 4 seconds of each other at the 1st mile. After the 2nd mile, the top 5 runners were still less than 15 seconds apart. The final 29 second 1-5 finishing split was the smallest among the 25 teams competing. In addition, a large contingent of parents, family members, and teammates made the trip to Peoria to support and cheer on the state team. All of this allowed the Mustangs to finish in 4th place, the highest team place in school history, edging past 5th place finishes in both 1985 and 1989. Congratulations to the best ever DGS girls cross country team! 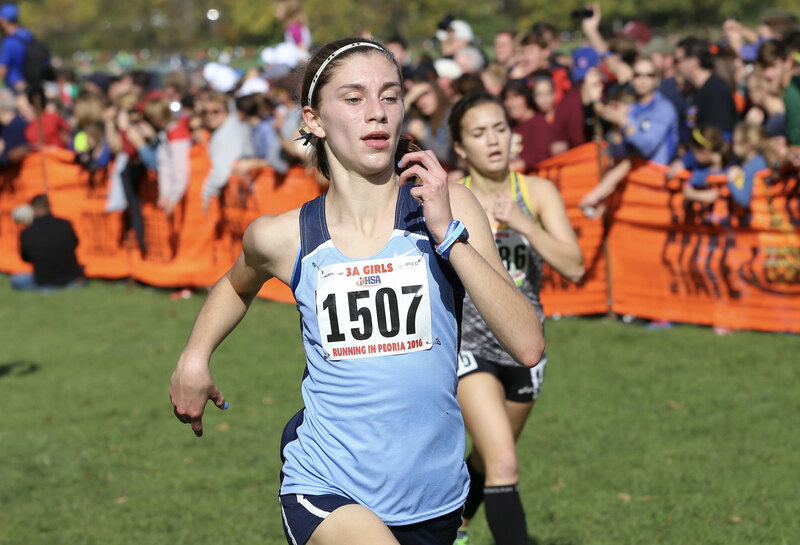 Author Coach PlunkettPosted on November 6, 2016 Categories Cross CountryLeave a comment on DGS Girls CC 4th in State! Of the 25 teams, several teams stand out as favorites for one of the top 3 trophy positions. The team from Minooka is the defending 3A state champion. They have 3 very good front runners in Ashley Tutt, Emily Shelton, and Mackenzie Callahan who have all had outstanding seasons so far. They have a #4 runner who is not too far back from those first three. If their #5 runner can stay close enough, Minooka should be the favorites to repeat. Last year’s runner-up, Naperville North, also returns a strong team led by front runner, Sarah Schmitt. The strength of the Naperville North team will be in the pack that follows Schmitt. If they can stay close to her, the Huskies could end up state champions. Yorkville is new to class 3A, but not new to state championships. The Foxes won 5 consecutive 2A state titles before moving up to 3A this season. They are built in similar fashion as Naperville North with a front runner in Nicole Greyer, followed by a solid pack. The Foxes must keep their pack close to their #1 runner if they want to take home the team title. Glenbard West has arguably the 2 best individuals in the state this season with Katelyn Hart and Lindsay Payne. Scoring only 3 points with your first two runners goes a long way in a meet this big. If their 3-4-5 runners can stay close enough to the dynamic duo, the Hilltoppers are capable of winning it all. Wheaton Warrenville South is another team with the ability to come home with a trophy. The Tigers are led by front runners, Sara Atkins and Allison McGrath. These two seniors provide a 1-2 punch that makes WWS a dangerous team. They have a solid 3rd runner, but their success will rely on how well the 4-5 runners perform in Peoria. Downers Grove South has been a surprise team much of this season after finishing 20th a year ago. The Mustangs have had a solid pack of 5 runners in nearly every meet this season. The finishing order has not always been the same, but the small gap between #1 and #5 has led to a lot of success so far. If that gap remains under 30 seconds, DGS will be in contention for one of those top 3 spots. Lyons Township came up short at last week’s sectional meet, but it wasn’t because of their top 2 runners, Sarah Barcelona and Emily Henkel. If the Lions are going to compete for a top 3 finish, their 3-4-5 runners must close the gap up on their top 2. Lockport tied LT for 2nd place at the sectional meet. They are led by front runner, Morgan Bollinger. The key for the Porters, like many of these teams, will be how far back their 4-5 runners will be. The other surprise team this season has been Palatine. The Pirates have continued to improve all season long and their sectional victory last week proves that they have put themselves into position to compete with the top teams in the state. A few other teams that should be competing for top 10 team finishes this weekend are: Neuqua Valley, Geneva, New Trier, Hinsdale Central, Hersey, and Metea Valley. Author Coach PlunkettPosted on November 3, 2016 Categories Cross CountryLeave a comment on State Meet Weekend!